Spider-Man is a fictional character who has been adapted in various media including television shows, films, toys, stage shows, books, and video games. Spider-Man has been adapted to television many times, as a short-lived live-action television series, a Japanese tokusatsu series, and several animated cartoon series. There were also the "Spidey Super Stories" segments on the PBS educational series The Electric Company, which featured a Spider-Man (played by Danny Seagren) who did not speak out loud but instead used only word balloons. 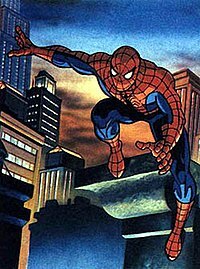 Spider-Man's first cartoon series ran from 1967-1970. Two Spider-Man cartoons aired on television in 1981: the syndicated series Spider-Man which ran for one twenty-six episode season, and the more popular Spider-Man and His Amazing Friends, which aired on the NBC network for three seasons (ultimately totaling twenty-four episodes). In Spider-Woman, Spider-Man appeared in "Pyramids of Terror" and "the Kongo Spider", voiced by Paul Soles. As a bit of foreshadowing, Spider-Man's hand appears shooting a web to save a citizen in the third season X-Men episode "Phoenix Saga (Part 5): Child of Light". This episode aired just months before the web-slinger's next series, Spider-Man, which ran for five seasons from 1994–1998, totaling 65 episodes, on Fox Broadcasting's afternoon programming block, "Fox Kids". In this series, Spider-Man was voiced by Christopher Daniel Barnes. That series continued as Spider-Man Unlimited the following year. Spider-Man Unlimited ended, after only one season, on a cliffhanger that was never resolved. Loosely based on the 2002 film continuity, Marvel editorial publisher Brian Michael Bendis developed a CGI spinoff for Mainframe Entertainment, with actor Neil Patrick Harris providing Peter Parker's voice. MTV picked up the show from July 11 to September 9, 2003. David and Greenberger p. 173: "It was notable...for being the first and thus far [as of 2010] the only Spidey animated series to be done as CGI." The next series, The Spectacular Spider-Man, premiered on March 8, 2008 and ran two seasons. Spider-Man/Peter Parker was voiced by Josh Keaton. Ultimate Spider-Man began airing on Disney XD in 2012. Peter Parker/Spider-Man is voiced by Drake Bell. This version has him team up with Iron Fist, Nova, Luke Cage and White Tiger while undergoing training with S.H.I.E.L.D. Spider-Man appears in some episodes of Avengers Assemble voiced again by Drake Bell in season one and two and by Robbie Daymond in season five. Spider-Man appears in some episodes of Hulk and the Agents of S.M.A.S.H. voiced again by Drake Bell. Spider-Man, a new Spider-Man animated series was announced in October 2016 to replace Ultimate Spider-Man. Peter Parker/Spider-Man is voiced by Robbie Daymond. Spider-Man appears in the Guardians of the Galaxy episodes "Back in the New York Groove" and "Drive Me Carnage," voiced again by Robbie Daymond. From 1978 to 1979, Nicholas Hammond starred as Peter Parker/Spider-Man in the live-action television series The Amazing Spider-Man. The short-lived series, which had started out as a TV film in 1977, was created before the popular The Incredible Hulk television series of the same decade, and ran for two abbreviated seasons consisting of 13 episodes during the 1977/1978 and 1978/1979 seasons. The series concluded with a two-hour episode on July 6, 1979. Takuya Yamashiro (山城拓也, Yamashiro Takuya) is Spider-Man in the Japanese Spider-Man television series, produced by Toei Company. Nicholas Hammond portrayed Peter Parker / Spider-Man on-screen in the 1970s The Amazing Spider-Man TV series, and in three films which were released theatrically in Europe. A film based on the Toei Spider-Man TV series named Spider-Man was shown at the Toei Manga Matsuri film festival on July 22, 1979. It was later screened theatrically in Japan. It was released on VHS in the 1980s and on DVD in 2004. This version appears in the Spider-Verse event, along with Leopardon. Spider-Man: On May 3, 2002, the feature film Spider-Man was released. It was directed by Sam Raimi and stars actor Tobey Maguire as Peter Parker. The film uses computer-generated imagery whenever Spider-Man does any action that can be troubling for Maguire and stuntmen (e.g. web slinging). Although the film adaptation took liberties with the character's history and powers—notably, he was bitten by a genetically modified rather than a radioactive spider (an idea originating with Ultimate Spider-Man), had organic web-shooters rather than mechanical ones, and had a long-standing crush on Mary Jane Watson—it generally held true to the character and was widely embraced by the viewing public. It opened at a record US$114.8 million and earned more than US$403 million in the U.S. and Canada, the highest North American gross of any film released that year, though surpassed internationally (see 2002 in film). The villain of this film was the Green Goblin portrayed by Willem Dafoe. Spider-Man 2 was 2004's second-most financially successful film in North America and third internationally (see 2004 in film). It premiered in more North American movie theaters (4,152) than any previous film. Its original opening day was July 2, 2004, but was moved to June 30, 2004. Its first-day gross (US$40.5 million) surpassed its predecessor's US$39.4 million record. Spider-Man 2 was also the first motion picture released in the Sony Universal Media Disc format for the PlayStation Portable, included free with the first one million PSP systems released in the United States. The villain of the film was Doctor Octopus, portrayed by Alfred Molina. Spider-Man 3 began production in 2005/2006 under director Raimi. The studio released the film on May 4, 2007, on a budget reported to be more than US$250 million. The film features three villains: the Sandman / Flint Marko (portrayed by Thomas Haden Church), the New Goblin / Harry Osborn (portrayed by James Franco), and Venom / Eddie Brock (portrayed by Topher Grace). Bryce Dallas Howard plays Gwen Stacy. The plot centers on Peter and MJ's relationship problems, which are exacerbated by the arrival of an alien symbiote that takes over Spider-Man's costume and, despite enhancing his powers, also amplifies his anger, arrogance and other negative personality traits. Despite mixed reviews by critics, Spider-Man 3 opened to record-breaking sales with $59 million on its first day. Spider-Man 4 began production in 2008 with Raimi attached to direct and the core cast of the previous films to return. A fourth, fifth and sixth film were all planned. Come 2009, however, Raimi dismissed the rumors that all three films were being made, instead confirming that only the fourth film was under development at the time. Sony hired James Vanderbilt in October 2007 to pen the screenplay, after contacting David Koepp, the screenwriter of the first film. The script underwent further revision by playwright David Lindsay-Abaire in November 2008 and twice more by Gary Ross in October 2009 and by Alvin Sargent. Sony had also hired Vanderbilt to pen scripts for Spider-Man 5 and Spider-Man 6. On the subject of villains, Raimi considered showcasing the transformation of Dr. Curt Connors into the Lizard, with Dylan Baker reprising his role. He also had plans to upgrade Bruce Campbell to a more significant role than his prior cameos, presumably as the villain, Mysterio. In December 2009, it was reported that John Malkovich was in talks to play the Vulture, with Anne Hathaway playing Felicia Hardy. Reports stated that Hardy would be taking a departure from her prior portrayals in this film, becoming "Vulturess" instead of the familiar Black Cat. In 2013, Raimi later denied the rumors and said that Hathaway would've been Black Cat if the film was ever made. Disagreements between Raimi and Sony threatened to push the release date back. Raimi reportedly doubted that he could adhere to the film's May 6, 2011 release date without sacrificing quality. Further complicating things, Raimi reportedly went through four revisions of the script, with different writers, and still "hated it". With so many issues, Sony cancelled the film in January 2010. The Amazing Spider-Man began production in December 2010 and was directed by Marc Webb from a screenplay by James Vanderbilt, Alvin Sargent, and Steve Kloves. Avi Arad and Laura Ziskin produced the 3D film released on July 3, 2012. Andrew Garfield assumed the role of Peter Parker. The film featured the villain Dr. Curt Connors / The Lizard (portrayed by Rhys Ifans), the love interest Gwen Stacy (portrayed by Emma Stone), and Peter's aunt May Parker (portrayed by Sally Field). A sequel, The Amazing Spider-Man 2 was announced in August 2012. Garfield, Stone and Field reprised their roles while Jamie Foxx, Dane DeHaan, Paul Giamatti, Colm Feore, Felicity Jones and Chris Cooper joined the cast as Max Dillon / Electro, Harry Osborn / Green Goblin, Aleksei Sytsevich / Rhino, Donald Menken, Felicia Hardy and Norman Osborn, respectively. The film was released on May 2, 2014. Sony Pictures announced that they had set release dates for the next two Spider-Man films. A third film was set for release on June 10, 2016, and a fourth for May 4, 2018. Sony also announced two spin-offs of the film series that will focus on Spider-Man villains, Venom and the Sinister Six. Sony had pushed back the third and fourth Spider-Man films, with their intended release dates respectively taken by an adaptation of the video game Uncharted and Avengers: Infinity War - Part I. After Sony and Disney's Marvel Studios reached a deal to reintroduce Spider-Man into the Marvel Cinematic Universe, the sequels of The Amazing Spider-Man series, including the proposed spin-off were officially cancelled. In March 2016, The Hollywood Reporter reported that Sony are moving forward with the standalone Venom movie with Dante Harper penning the script while Avi Arad and Matt Tolmach will be producing and overseeing the project. On February 9, 2015, Sony and Spider-Man owner, Walt Disney, announced a deal for Spider-Man to appear in the Marvel Cinematic Universe (M.C.U.) with a new film to be released on July 7, 2017. The companies later said on June 23, 2015 that, after many auditions, Tom Holland had been cast to play Spider-Man within the M.C.U. In November 2016, Holland announced that he signed a multi-picture contracts for six films in the M.C.U. A scene in Iron Man 2 (2010), depicts a young boy in a child's Iron Man mask standing bravely in front of one of Justin Hammer's robots, which takes aim at him. Just in time, the boy is rescued by Anthony "Tony" Stark / Iron Man. Tom Holland confirmed in a 2017 interview that it was retroactively decided that the boy was Peter Parker. Max Favreau, the son of director Jon Favreau, plays young Peter Parker. The first reference to Spider-Man within the Marvel Cinematic Universe, following the deal with Sony, is at the end of Ant-Man. According to director Peyton Reed, the reference is made by a reporter who says to Samuel "Sam" Wilson / Falcon who is looking for Ant-Man. The reporter states, "Well, we got everything nowadays. We got a guy who jumps, we got a guy who swings, we got a guy who crawls up the walls, you gotta be more specific." Peter Parker's first on-screen Marvel Cinematic Universe appearance in Captain America: Civil War (2016), when Tony Stark recruits him to fight alongside his faction of the Avengers. In the post-credits scene, he fiddles with a device that projects the Spider Signal on the ceiling in his bedroom. Holland reprises his role as Peter Parker / Spider-Man in Avengers: Infinity War. In the film Peter joins Stark, Stephen Strange, Star-Lord, Drax and Mantis in combating Thanos on Titan while wearing the Iron Spider suit and is one of the intergalactic despot's victims when he assembles the Infinity Gauntlet. Spider-Man will also appear in Avengers: Endgame. A sequel to Homecoming; titled Spider-Man: Far From Home is scheduled to be released on July 5, 2019. Spider-Man appears in the animation for the 1986 Marvel Productions logo, having his suit turned silver after the MP logo zooms out and disappears. Spider-Man appears in Lego Marvel Super Heroes: Maximum Overload, voiced by Drake Bell. Spider-Man appears in Lego Marvel Super Heroes: Avengers Reassembled voiced by Benjamin Diskin. He and Iron Spider discover a shrunken Yellowjacket on a web while training on the S.H.I.E.L.D. Helicarrier. They did help the Avengers get a confession from Yellowjacket about Ultron's plans. The Miles Morales, Peter Parker, and Noir versions of Spider-Man appear in Spider-Man: Into the Spider-Verse, produced by Sony Pictures Animation and Disney's Marvel Studios and directed by Bob Persichetti; they are respectively played by Shameik Moore, Jake Johnson, and Nicolas Cage. Chris Pine also portrayed a version of Peter Parker in the film that is similar to his Earth-1610 counterpart. Spider-Man features in three original Marvel novels published in the 1970s by Pocket Books -- Mayhem in Manhattan by Len Wein and Marv Wolfman, and Crime Campaign and Murder Moon, both by Paul Kupperberg. In the 1990s, Byron Preiss published a series of novels based on Marvel Comics, edited by Keith R. A. DeCandido, and written by various authors including Adam-Troy Castro, Tom DeFalco, and Diane Duane; Preiss also published two Spider-Man short-story anthologies. Byron Preiss' license eventually lapsed, and the new licensee, Pocket Star (an imprint of Pocket Books), released Down These Mean Streets, by DeCandido, in 2005. In 2006, they released The Darkest Hours by Jim Butcher, and in 2007, Drowned in Thunder by Christopher L. Bennett. Some of the Preiss novels were team-ups with other Marvel characters (including the X-Men, Iron Man, and the Hulk), while others were solo adventures. The Byron Preiss novels shared a common continuity and occasionally referenced events in earlier novels, while later novels included a time-line. A number of Spider-Man children's books have also been published, from early readers and picture books to novels. Guide books include DK Publishing's Spider-Man: The Ultimate Guide, by Tom DeFalco and Spider-Man: Inside the World of Your Friendly Neighborhood Hero by Matthew K. Manning. Spider-Man appears in the Spider-Woman motion comics. In this series, he is voiced by Geoff Boothby. The daily newspaper comic strip The Amazing Spider-Man debuted on January 3, 1977. Mr. and Mrs. Spider-Man was published in 2008. Spider-Man appeared in two Peanuts strips. In one, Spider-Man webs up Lucy so Charlie Brown can kick the football while in the other he webs up Snoopy and spins him around as a prank. In 1995, BBC Radio commissioned a Spider-Man radio play which aired on BBC Radio 1 over 50 episodes on week days between January 15, 1996 and March 24, 1996. The performance was co-produced by Brian May, who also contributed to the musical arrangement and wrote and performed the theme tune. The scope of the story included a number of familiar characters from the Spider-Man comic books as well as key figures from the Marvel Universe such as the Fantastic Four, Namor the Submariner, and Doctor Doom. The role of Spider-Man was performed by William Dufris. The cast list included EastEnders star Anita Dobson. Spider-Man: Turn Off the Dark promotional poster. In 1987 Marvel staged a mock wedding at Shea Stadium as publicity stunt to promote the wedding issue of the Amazing Spider-Man. At the Butlins family entertainment resorts in the United Kingdom, a musical titled Spider-Man On Stage played in 1999. The show contained music by Henry Marsh and Phil Pickett and a book and lyrics by David H. Bell. The original cast album by Varios Records runs 44 minutes. In 2002, the company 2MA produced the first live-action Spider-Man stunt show, staged in Jeddah, Saudi Arabia. The same show played at Thorpe Park in Surrey, England in 2003 and 2004. Spider-Man has also made stage appearances in Pantomime at the Birmingham Hippodrome Theatre and the Churchill Theatre, Bromley, United Kingdom. In 2003 a similar stage show called Spider-Man Live! toured North America. At Universal Studios Hollywood in Los Angeles, a musical stage version (loosely based on the 2002 live-action film and based on the comics) titled Spider-Man Rocks! was produced, combined singing and action stunt sequences similar to a Broadway musical. The attraction ran from May 2002 to August 2004, when it was replaced by Fear Factor Live! Because it is loosely based on the 2002 film, Green Goblin is basically in his comic book form instead of his movie form. A Broadway musical titled Spider-Man: Turn Off the Dark opened at the Foxwoods Theatre in New York on June 14, 2011. The show is directed by Julie Taymor and features music by Bono and The Edge. The production stars Reeve Carney, Jennifer Damiano, T.V. Carpio and Patrick Page. The musical is the most expensive piece of live theatre to date, and features high-flying action sequences and stunts. It holds the record for the most preview performances, with 182 before its opening. Spider-Man is featured in Marvel Universe Live!, a 2014 arena show. Spider-Man, and other Marvel characters, currently make live appearances in Hollywoodland at Disney CALIFORNIA Adventure. Dozens of computer and video games starring Spider-Man have been released for over 15 different gaming platforms. The Amazing Spider-Man, a puzzle-oriented action game developed by Oxford Digital Enterprises and released in 1990 for the Amiga, then later ported to PC:DOS, Commodore 64, and Atari ST. The title was published by Paragon Software Corporation and features over 250 screens. In 1990, The Amazing Spider-Man vs. The Kingpin, developed and published by Sega, premiered on the Sega Master System and was later ported to the Mega Drive/Genesis in 1991, the Sega Game Gear in 1992, and the Sega Mega-CD in 1993. Fundamentally, the game is the same on each platform with each iteration including new levels, enhanced graphics and a few incremental improvements to the game play. The story involves Spider-Man trying to collect six keys from six villains to defuse a bomb in New York planted by the Kingpin. Spider-Man has a finite supply of webfluid and the only way to replenish is to take photos, most profitably of the supervillains, to sell to the Daily Bugle. The Amazing Spider-Man is the title of a video game released for the original Nintendo Game Boy. It was published in 1990 by LJN Ltd. (a subsidiary of Acclaim), and developed by Rare. It is a platform side scrolling action game. The game play involves running across New York chasing supervillains to locate Mary Jane Watson. The Amazing Spider-Man 2 was released the following year and was developed by B.I.T.S. The game is a side-scrolling beat-'em up. Spider-Man attempts to clear his name after he is accused of a crime committed by the Hobgoblin. In 1993, B.I.T.S. released the third in the series titled, The Amazing Spider-Man 3: Invasion of the Spider-Slayers. As well as various games based on the Spider-Man license, Spider-Man has also appeared in a few cross-over titles. He appears as a guest character in X-Men: Mutant Academy 2 and Tony Hawk's Pro Skater 2. Spider-Man appears in Marvel: Ultimate Alliance voiced by Quinton Flynn. He is one of the main heroes that help Nick Fury fight Doctor Doom's Masters of Evil. Spider-Man appears in its sequel Marvel: Ultimate Alliance 2 voiced by Benjamin Diskin. He is also a playable character in Capcom's series of Marvel-based fighting games, first appearing in Marvel Super Heroes as well as every game in the Marvel vs. Capcom series of games starting from Marvel Super Heroes vs. Street Fighter. For Marvel Super Heroes and the first two games, he was voiced by Patrick Chilvers. But for the next one, it was Josh Keaton and for the game Marvel vs. Capcom: Infinite, it was Robbie Daymond. While not appearing in the main series due to licensing issues, Spider-Man appears in Marvel Super Hero Squad, Marvel Super Hero Squad: The Infinity Gauntlet, and Marvel Super Hero Squad Online as a playable character. For Marvel Super Hero Squad and Marvel Super Hero Squad: The Infinity Gauntlet, he is voiced by Josh Keaton and for Marvel Super Hero Squad Online, all male Spider-Man characters are voiced by Mikey Kelley and Yuri Lowenthal. He appears as a playable character in the Facebook game Marvel: Avengers Alliance and its companion games Marvel: Avengers Alliance Tactics and Marvel: Avengers Alliance 2. Spider-Man appears as a non-playable character in the 2003 game, X2: Wolverine's Revenge voiced by Rino Romano. In a deleted scene, Wolverine encounters Spider-Man off his home turf. Spider-Man states that he heard about the big breakout at the Void and rode out to the town on the charter bus with the other superheroes who can't fly or teleport. When Spider-Man asks if Wolverine needs help fighting Magneto, Wolverine has him deal with the chaos in town until Damage Control arrives. He is also mentioned in the 2013 video game Deadpool. Spider-Man is a playable character in the 2014 and 2015 games Disney Infinity: Marvel Super Heroes and Disney Infinity 3.0, with Drake Bell reprising his role. The Amazing Spider-Man is a game based on the 2012 movie of the same name for the PlayStation 4 and the Xbox One, A sequel The Amazing Spider-Man 2 was released in 2014 along with the movie of the same name. Spider-Man was voiced by Sam Riegel for both of these games. A new Spider-Man game was announced during the Sony Electronic Entertainment Expo 2016 Press Conference under the working title "Spider-Man PS4" with the hashtag #spidermanPS4. Yuri Lowenthal reprises his role as Spider-Man from Marvel Super Hero Squad Online and Spider-Man Unlimited. Spider-Man appears as a playable character in various mobile games such as Marvel Future Fight, Marvel Contest of Champions, Marvel Puzzle Quest, and Marvel Strike Force. Spider-Man headlines as a main protagonist in 1999's The Amazing Adventures of Spider-Man attraction located at Universal Orlando's Islands of Adventure in Orlando, Florida and Universal Studios Japan in Osaka, Japan. The ride was considered to be groundbreaking as it combines 3-D film, ride movement, and special effects for the very first time. The plot centers around Spider-Man trying to prevent the evil Sinister Syndicate who attacks New York City and takes the Statue of Liberty hostage, and the New York City Police Department (NYPD) was powerless to stop them. Many reporters flee the Daily Bugle building as the result of the carnage left by the Syndicates, leaving only the tourists within the building. With no reporters left, editor-in-chief J. Jonah Jameson sends the tourists out to cover the story using the new SCOOP vehicle. Walt Disney Imagineering, in collaboration with Disney's Marvel Studios and Disney's Marvel Themed Entertainment divisions, is currently developing Marvel-themed areas for Disney CALIFORNIA Adventure, Walt Disney Studios Park in Paris, and Hong Kong Disneyland that are slated to open around 2020, and a Spider-Man attraction is widely-expected to be included, at least in the California installation. Spider-Man appears in several episodes of the stop-motion animated web series Marvel Superheroes: What the--?!. Italian Spiderman, an Australian film parody of Italian action–adventure films of the 1960s and 1970s, first released on YouTube in 2007. Spider-Man: is an unauthorized short film directed by Donald F. Glut and released in 1969. Spider-Man Versus Kraven the Hunter: a 1974 short film written and directed by Bruce Cardozo, endorsed by Marvel Comics and authorized by Stan Lee. Viva Spider-Man: a 1989 student film. Its creator Jim Krieg went on to write for Spider-Man: The Animated Series. The Green Goblin's Last Stand: a 1992 fan film, based on The Amazing Spider-Man comic book story "The Night Gwen Stacy Died", directed, written, and starring actor-stuntman Dan Poole. It was acclaimed for its high-risk stunts and guerrilla marketing. '60s Spider-man is from Spider-Man animated television series. ^ a b Fickett, Travis; Goldman, Eric; Iverson, Dan; Zoromski, Brain (May 3, 2007). "Spider-Man on TV - We look back at the history of the web slinger on the small screen". IGN. Archived from the original on June 6, 2013. Retrieved June 2, 2013. ^ David, Peter; Greenberger, Robert (2010). The Spider-Man Vault: A Museum-in-a-Book with Rare Collectibles Spun from Marvel's Web. Philadelphia, Pennsylvania: Running Press. pp. 168 and 170. ISBN 0762437723. In 1981, Spider-Man saw something of a banner year: he actually had competing animated series. ^ Truitt, Brian (October 8, 2016). "Exclusive: New Spider-Man animated series coming in 2017". USA Today. Archived from the original on October 30, 2016. ^ Brooks, Tim; Marsh, Earle (1995). The Complete Directory to Prime Time Network and Cable TV Shows 1946–Present Sixth Edition. New York, New York: Ballantine Books. p. 37. ISBN 9780345397362. ^ Sciretta, Peter (January 19, 2010). "Marc Webb To Direct New Spider-Man Trilogy!?". /Film. Archived from the original on May 18, 2011. Retrieved January 20, 2010. ^ "It's Official! Andrew Garfield to Play Spider-Man!". CraveOnline. July 1, 2010. Archived from the original on July 5, 2010. Retrieved July 1, 2010. ^ "Sony Sets Release Dates for 3rd and 4th Spider-Man Films!". ComingSoon.net. June 17, 2013. Archived from the original on August 25, 2013. ^ McClintock, Pamela (June 17, 2013). "Sony Sets Release Dates for Third and Fourth Amazing Spider-Man Films". The Hollywood Reporter. Archived from the original on August 25, 2013. ^ Patten, Dominic (December 13, 2013). "Sony Sets Spider-Man Spinoffs Venom, Sinister Six With New 'Franchise Brain Trust'". Deadline Hollywood. Archived from the original on October 7, 2014. Retrieved December 14, 2013. ^ Kit, Borys (January 6, 2014). "Forget Franchises: Why 2014 Will Be Hollywood's Year of the 'Shared Universe'". The Hollywood Reporter. Archived from the original on November 5, 2014. ^ Siegel, Tatiana; Kit, Borys (July 23, 2014). "Spider-Man Villains Movie Sinister Six Gets Nov. 2016 Release Date". The Hollywood Reporter. Archived from the original on November 15, 2014. ^ McClintock, Pamela (July 23, 2014). "Marvel Snaps Up Old Spider-Man 4 Date, Likely for Avengers 3". The Hollywood Reporter. Archived from the original on November 16, 2014. ^ Strom, Marc (October 28, 2014). "Marvel's The Avengers Head Into an Infinity War". Marvel Comics. Archived from the original on October 30, 2016. ^ Lang, Brent (February 10, 2015). "Spider-Man: How Sony, Marvel Will Benefit from Unique Deal (Exclusive)". Variety. Archived from the original on October 18, 2015. ^ Kit, Borys (March 4, 2016). "Spider-Man Spinoff Venom Revived at Sony (Exclusive)". The Hollywood Reporter. Archived from the original on July 8, 2016. ^ Couch, Aaron (November 9, 2016). "'Spider-Man': Tom Holland Reveals How Many Marvel Films He's Signed For". The Hollywood Reporter. ^ Bradley, Bill (June 26, 2017). "Tom Holland Confirms Fan Theory About Spider-Man's Cameo In 'Iron Man 2'". Huffington Post. Retrieved June 26, 2017. ^ Ryan, Mark (June 27, 2017). "'Spider-Man: Homecoming' Director Jon Watts Explains Real Story Behind Peter Parker's 'Iron Man 2' Cameo". Uproxx. Archived from the original on June 27, 2017. Retrieved June 27, 2017. ^ Wilding, Josh (July 20, 2015). "Peyton Reed talks about that Spider-Man reference in Ant-Man". Spidermannews.com. Archived from the original on October 10, 2016. ^ Perry, Spencer (June 23, 2015). "Tom Holland is the New Spider-Man and Will be Directed by Jon Watts!". SuperHeroHype. Archived from the original on November 19, 2015. ^ Kroll, Justin (June 23, 2015). "Tom Holland Is the new Spider-Man, Jon Watts to Direct Film". Variety. Archived from the original on October 27, 2015. ^ Lang, Brett (April 12, 2016). "'Spider-Man' Movie Gets Official Title". Variety. Archived from the original on April 13, 2016. Retrieved April 13, 2016. ^ Couch, Aaron (February 10, 2017). "'Avengers: Infinity War' Featurette Shows Off First Footage From Set". The Hollywood Reporter. Archived from the original on February 11, 2017. Retrieved February 10, 2017. ^ D'Alessandro, Anthony (December 9, 2016). "'Spider-Man: Homecoming 2' Shoots Web Around Independence Day 2019 Frame; 'Bad Boys 4' Moves To Memorial Day". Deadline Hollywood. Archived from the original on December 10, 2016. Retrieved December 9, 2016. ^ Borys Kit, Borys (June 22, 2016). "Sony Unveils Plans for Animated 'Spider-Man' and 'Emojimovie: Express Yourself'". The Hollywood Reporter. ^ Schmidt, J.K. (November 29, 2018). "'Spider-Man: Into the Spider-Verse' Features Chris Pine in a Surprising Cameo". ComicBook.com. Archived from the original on November 30, 2018. Retrieved November 30, 2018. ^ Saffel, Steve (2007). "A Novel Approach". Spider-Man the Icon: The Life and Times of a Pop Culture Phenomenon. London, United Kingdom: Titan Books. p. 98. ISBN 978-1-84576-324-4. Spider-Man led the way when Simon and Shuster published Mayhem in Manhattan by Len Wein and Marv Wolfman, under the Pocket Books imprint. ^ DeFalco, Tom (2001). Spider-Man: The Ultimate Guide. London, United Kingdom: Dorling Kindersley. p. 168. ISBN 978-0789479464. ^ Manning, Matthew K. (2012). Spider-Man: Inside the World of Your Friendly Neighborhood Hero. London, United Kingdom: Dorling Kindersley. p. 200. ISBN 978-0756690892. ^ Saffel, "An Adventure Each Day", p. 116: "On Monday January 3, 1977, The Amazing Spider-Man comic strip made its debut in newspapers nationwide, reuniting writer Stan Lee and artist John Romita." ^ Maggs, Dirk (2009). "The Amazing Spiderman". DirkMaggs. Archived from the original on October 12, 2008. Retrieved June 2, 2013. ^ Gans, Andrew (August 10, 2010). "Reeve Carney, Jennifer Damiano, Patrick Page to Star in Spider-Man; Performances Begin in November". Playbill. Archived from the original on July 28, 2011. ^ "Character Reveals for Marvel Universe LIVE!". Marvel Comics. November 25, 2013. Archived from the original on October 30, 2016. ^ "The Amazing Spider-Man". Moby Games. December 30, 2008. Archived from the original on December 21, 2011. Retrieved September 13, 2010. ^ Glover, Erin (July 15, 2017). "Immersive Super Hero Experience Coming to Disney California Adventure Park". Disney Parks Blog. ^ Glover, Erin (March 20, 2018). "Avengers and Other Super Heroes to Assemble in New Themed Areas at Disneyland Resort, Disneyland Paris and Hong Kong Disneyland". Disney Parks Blog. ^ Sims, Chris (June 22, 2012). "The Surprisingly Coherent Spider-Man Fan Film From 1969". ComicsAlliance. Archived from the original on September 24, 2015. It’s an 11-minute fan-film produced by Donald Glut in 1969, in which Spider-Man (played, of course, by Glut) battles against a supervillain called 'Dr. Lightning'. This page was last edited on 6 April 2019, at 09:38 (UTC).